Stella Dorothy Sabiston, the daughter of a clergyman and a mother who was an accomplished painter, was born April 26, 1903, in Birmingham, AL. With aspirations to be a dancer and film actress against her parents' wishes, she left the University of Alabama and went to New York City to follow her dream. She danced at the prestigious Ned Wayburn Academy and took elocution lessons to diminish her Southern drawl. 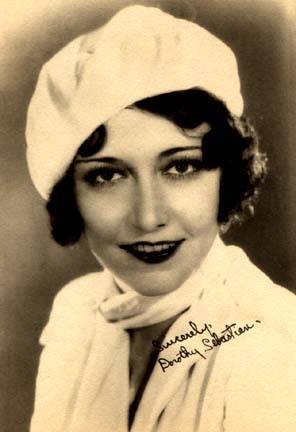 Nevertheless, she encountered many rejections before landing a job (as Dorothy Sebastian) in "George White's Scandals" in June 1924. The show ran for 198 performances, and, reportedly during this time, she developed a close relationship with Lord Beverbrook . After attending a party at the Ritz Hotel in an apartment owned by producer Otto Kahn, she ended up with a contract at MGM. She made four or five films a year, sometimes in uncredited roles, starting in 1925. One significant supporting role came in John Gilbert's "Twelve Miles Out" in 1927; however, she is probably best remembered for her role as Beatrice in "Our Dancing Daughters" (1928) which brought both Joan Crawford and Anita Page to fame. A small part in "A Woman of Affairs" (1928) with Greta Garbo followed, then four more forgettable films before co-starring with Buster Keaton in "Spite Marriage" in 1929. That was followed with a small role in another Garbo picture, "The Single Standard" (1929). Things did not go particularly well for Sebastian in the ensuing years. She reportedly had an affair with Buster Keaton. She married William Boyd in 1930 that ended up in acrimonious divorce proceedings in 1938. At the end of her five year contract with MGM, she asked for raise over her $1,000 a week salary and was refused. She ended up in some poverty row pictures and spend most of the next 12 years in minor and/or uncredited roles. She worked during the war years as an x-ray technician at a defense plant while still doing an occasional role. She only appeared in six films during the 1940's, but had 67 film credits during her career. She became ill in the 1950's, and after a lengthy period of illness, she died of cancer at age 53 in 1957 at the Motion Picture Country House in Woodland Hills, CA.